I can’t wait to get back to reading Huevos verdes con jamón por Dr. Seuss to students in Honduras while testing water filters in schools. I have come to value the art of play as well as work when testing water in communities. 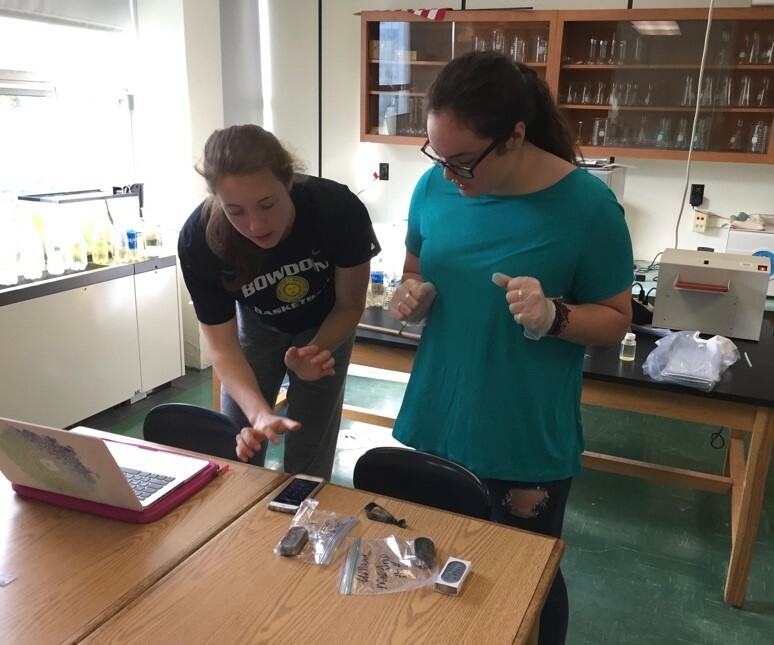 This spring I was very grateful to receive the opportunity through Bowdoin College to be an intern for Pure Water for the World (PWW) during the summer of 2017 as we study solutions for both providing clean drinking water to schools in Honduras as well as investigating water quality testing, techniques, and lab skills to be used by the PWW office in Port-au-Prince, Haiti. 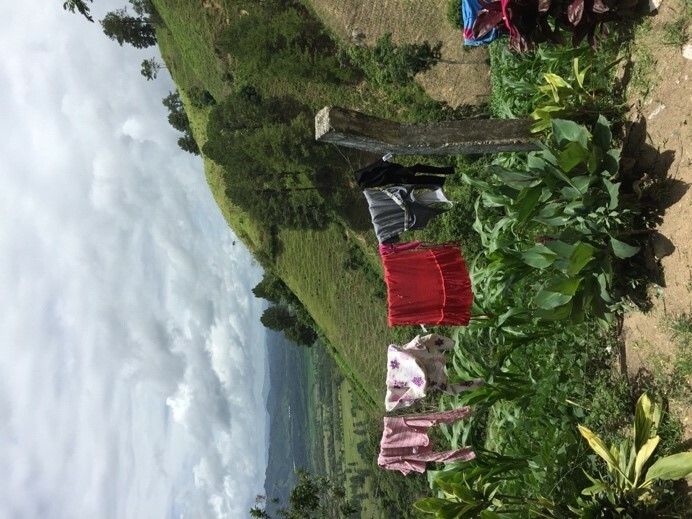 In June, I am conducting research on the biosand filters, as well as writing up past research to be shared with the scientific community, and planning for work to be done in PWW international offices in Haiti and Honduras during July. Biosand filters (BSFs) are slow water filtration systems that have proven to be effective in providing clean drinking water to households when paired with proper water, sanitation, and hygiene education (WASH). BSFs require an activation period to establish the biolayer, a colony of microbiological organisms that lives in the top layer of the filter, or a reactivation period if the filter has been inactive for a length of time longer than the recommended period of 1-48 hours. Since school schedules can be rather variable, it is important to test the reactivation and activation periods in the filter to find the most effective way to maintain them in the field. Through collaboration with Pure Water for the World, Dr. Barbara Stewart as my mentor, and with the assistance of fellow travelers to Honduras, I studied the reactivation of this biolayer after four BSFs have been inactive for around 3 months. Biosand filters with 5-gallon containers with MadiDrops. With the help of a fellow traveler to Honduras/UMaine chemical engineering student, Jonathan Musor, I poured a total of ten buckets of source water through the filters daily for a week to see if pouring four buckets through the first, three buckets through the second, two through the third, and one through the fourth would have an impact on how quickly the biolayer can reestablish itself. 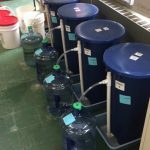 All ten, five-gallon buckets of source water a day were lugged out of a local stream to be driven via minivan across town to the water lab in Bangor High School. Fortunately, I found that this lackluster task was both short-lived as well as extra cross-training for basketball. In a slightly disappointing turn of events, after collecting 65 samples for microbiological testing and measuring turbidity and flow rate of the filters, I left this 5-day laboratory excursion with inconclusive results. Although significant differences in flow rate between the filters prevents conclusions about the impact of volume of water through the filter on speed of biolayer reestablishmemt, these results suggest that the key to biolayer reestablishment is time, not quantity of water. To the average Joe this may seem like a wasted week of 8 hours/day of water science, but I learned a lot from this experience and we (Dr. Stewart and I) were even able to generally conclude that no matter what we seem to do to these biosand filters in the lab, they always seem to bounce back in their performance after some time has passed. 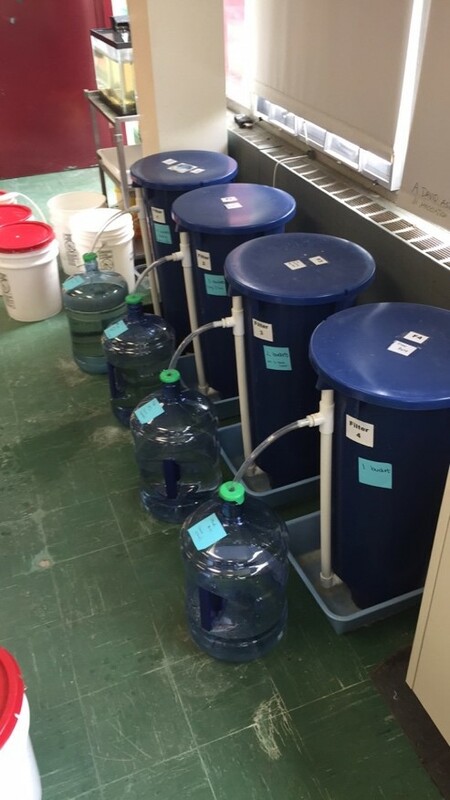 While frequency of pouring water through the filters, environment of the filter, source water contamination, and filter maintenance may all vary, one thing remains constant; these filters have cleaner effluent than straight source water and their performance only improves with time in the activation/reactivation stages. Lucky for me, any results from this study can be made useful in improving biosand maintenance guidelines because their applications in the field have not been widely tested. I left this study very hopeful for the use of biosand filters in Honduras and ready to continue testing their functionality in the school setting. I also learned an important personal lesson; I greatly appreciate (and maybe even love??) the routine, level of thought, and meticulous techniques required by laboratory work when you are pursuing the simple curiosity of scientific inquiry to improve the health of people in need. Jordyn Miller, a student at Bangor High School, and I working on data collection in the morning. Jordyn was a huge help in the mornings before school in getting the biosand filter study off and running for the day. Last week was also busy in the water lab because antimicrobial silver ion technology in the MadiDrop emerged as an intriguing solution for safe drinking water storage when used in tandem with biosand filters. Jon and I ended up running microbial 56 tests on MadiDrop performance over time in the effluent water from each biosand filter. The MadiDrops used had varying histories: one was new, one had been used to treat effluent water from biosand filters in an earlier study that year, and two had been used in a twelve-month long study where they were subjected to high levels of contamination. Current recommendations for MadiDrops suggest that after six months, there is a decrease in their performance for microbial removal. After testing the MadiDrops at a few hours and a day later, we found that the new MadiDrop was able to remove 100% of the microbial contamination while the other filters were not so successful; supporting the suggestion that as MadiDrops age, they require more time to eliminate contamination and struggle to remove 100% of the bacteria. At the end of the week, I listened in on a conference call to MadiDrop manufacturers who were curious to see what the twelve-month study on MadiDrops had for results and learned a lot more about how this technology worked just by listening to some of the experts. So far in the world of non-profit work, I have observed how an incredible amount can be accomplished through meetings and conference calls that would never happen without such collaboration. By sitting knowledgeable, passionate people down in a room, you can improve access to clean drinking water and anything is possible. The writing process never ceases to amaze me. Many hours have to be spent crafting words to be just right, especially when scientific content of that craft requires a characteristic process of word distillation. The deadline for abstract submission for the University of North Carolina Water and Health Conference came around on June 14th. We certainly had our work cut out for us, as there were three abstracts that needed to be submitted in order to try and share all of the water work done over the past year. While each abstract had a limit of only 3000 characters, around 500 words, we had originally written these abstracts to meet a limit of 300 words through many other previous drafts. The big scramble for including more data in these abstracts to satisfy the word limit happened the day these were due…and what a scramble it was. 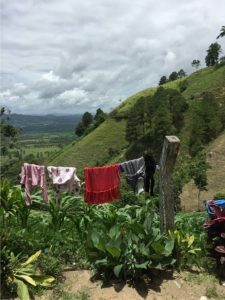 The first abstract summarized Water for ME’s findings in our study last summer on biosand filters in Honduran schools and was primarily my responsibility to put together. The second and third abstracts detailed all of the laboratory work conducted on biosand filters and MadiDrops, respectively, in the past year. I have thought about this hilltop(shown on the right) quite often in the past year, ever since last summer when I met a beautiful three-year-old there. She was being carried around the house by her mother and sisters due to her inability to walk and I was touched by the dire needs of the family. As such, I have been poking around in my connections at church to see if we can do something to help her, as we will be returning to that same school this July. During the school year I read about a Bowdoin graduate who had created a non-profit that creates and distributes standers, wood-based devices that help children with cerebral palsy in developing countries improve quality of life. I got in contact with a physical therapist who does mission work in the Dominican Republic and asked her if she knew anything about standers or had any advice about how to approach the situation. She gave me a list of questions to ask the family, her contact information to send videos and pictures from the field of spinal mobility/muscular tone, along with a book about cerebral palsy containing basic instructions for parents on how to safely maneuver a child without leg function. During our week in Honduras, the following plan emerged to see if anything can be done: 1) arrange to visit this distant community where this family lives early in the week 2) send information via pictures/videos back to the states, and 3) if anything immediate can be done while in-country, do it! Stay tuned for more updates from Cordelia as she continues this exciting study! 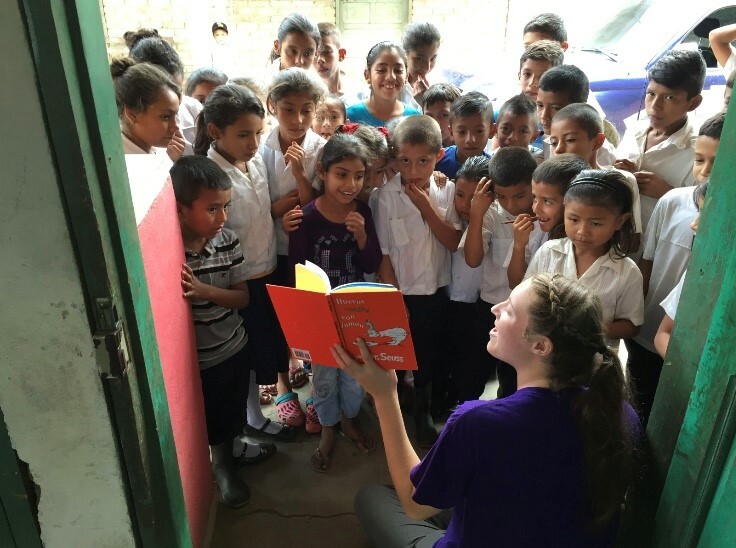 PWW Travelers Bio sand filter, Bowdoin College, Honduras, Study abroad, WASH, WASH program, water testing. permalink.